click on this link or the picture of the book above. Coming Soon! Spiritual Vitamins for your Kindle. Soon you will be able to order your digital copy. Also if you do not have a Kindle you will be able to get the software for your PC, Mac, iPad, iPhone, Blackberry and other devices by clicking here. If you are an Amazon Prime Member One A Day Spiritual Vitamins will be free through the lending library! The quotes and writings you will find in this book are created from the writings of Wayne Austin. One a Day Spiritual Vitamins stems from the idea one could find a quiet space...place...pace to open the 365-page book during each day and read either as one gets up in the morning and...or as one goes to sleep at night, hence receiving their "spiritual vitamin" for the day. What you will find on here on these pages is the full book. You may come and get your vitamin here at the website each day (free of charge). Please note: This site is not based in or on any religious principles including the Bible. If you have any questions please click here or on the Contact tab above. 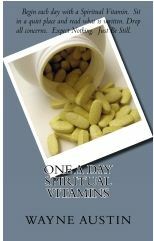 If you would like a printed copy of One A Day Spiritual Vitamins, either click here or on the Order tab above. For your Daily Vitamin, click here or on the Daily Spiritual Vitamin tab above.